The three day Battle of Bentonville produced a total of 4,133 casualties. Union losses were 1,527, with 194 killed, 1,112 wounded, and 221 missing and captured. Confederate casualties totaled 2,606, with 239 killed, 1,694 wounded, and 673 missing and captured. Many of the wounded found themselves in a field hospital set up by Sherman's Fourteenth Army Corps. Its surgeons, searching for a safe location, chose the modest two-story farm home of John and Amy Harper, and wounded began streaming to this makeshift medical facility within minutes of its establishment a mile from the chaotic front lines. 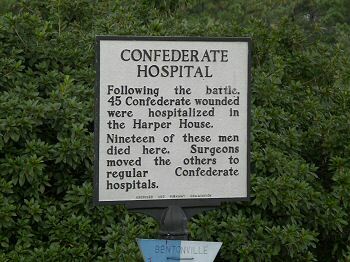 Throughout March 19 and 20, Federal surgeons at the Harper House treated a total of 554 men, both Union and Confederate. Without the benefit of antibiotics to stop infection, doctors amputated shattered arms and legs to prevent gangrene from claiming their patients' lives. Despite the screams of the wounded, the piles of severed limbs, and the stench of blood and chloroform (an anesthetic used by Union surgeons) that pervaded the Harper House, the family refused to leave their home during this time. The Battle of Bentonville was the last major fight in the Civil War. The following report from Surgeon John H. Moore, one of Gen. William T. Sherman's medical officers, showed how care and treatment had changed since First Manassas. On the 19th of March a fierce attack was made by the whole rebel force, under Gen. Joe Johnston, upon the advance and flank of the marching column of the Left wing. The wounded were well cared for in hospitals erected about half a mile in rear of the front or line of battle. On the 19th they came under fire and had to be removed. 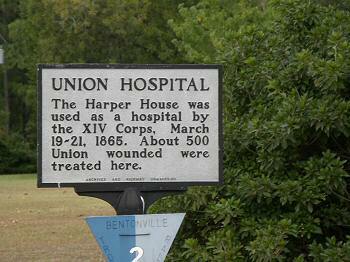 The Harper House was quickly overwhelmed by Union and Confederate wounded during the Battle of Bentonville. Although this battle occurred nearly at the close of a long march--of two month's duration, without an opportunity of replenishing supplies--there was no lack of any article essential to the comfort of the wounded. Most of those wounded on the 19th were made as comfortable as possible in wagons and moved on the 20th to the vicinity of the Neuse river, opposite Goldsborough, a distance of about twenty-five miles. Army wagons were used in consequence of a scarcity of ambulances. On the march the system of division hospitals was kept up and found to work well....After the last two battles some inconvenience was felt, owing to the deficiency of ambulances. Most of those in use in this army were supplied during the first year of the war and are worn out. One hundred new ones have been received here. No instance of serious neglect of duty on the part of the medical officers has come to my knowledge, but on the contrary they have been faithful and zealous in the performance of duty, and the wounded have been promptly removed from the field to the hospitals. The new system of ambulance organization has been more or less completely carried into effect in all the corps and has worked well. The character of the wounds in the cases of those brought to the hospitals was of an unusually grave character, much of the firing being at short range. Of the 1,368 wounded brought to the hospitals 131 died within forty-eight hours. There were eighty-eight capital amputations in cases brought to the hospitals from the battles of the 16th and 19th of March. Sources: North Carolina Office of Archives and History; National Park Service; Bentonville Battlefield State Historic Site. “In Freemon's vivid account, one almost sees the pus, putrefaction, blood, and maggots and . . . the unbearable pain and suffering.” Interesting historical accounts, statistical data, and pictures enhance this book. This research is not limited to the Civil War buff, it is a must read for the individual interested in medicine, medical procedures and surgery, as well as some of the pioneers--the surgeons that foreshadowed our modern medicine. Ironically, his research reflects that the majority of the ill and wounded soldiers who died had expired due to a burgeoning and developing medical system. Medical advancements, however, had progressed from primitive to slightly better by the end of the conflict. Cunningham further explains that while the Confederate doctors did the best that they could with their resources and shortcomings, there were some exceptional doctors who aided in the advancement of both medicine and medical treatment.